Yogi Berra was truly a one-of-a-kind American icon. 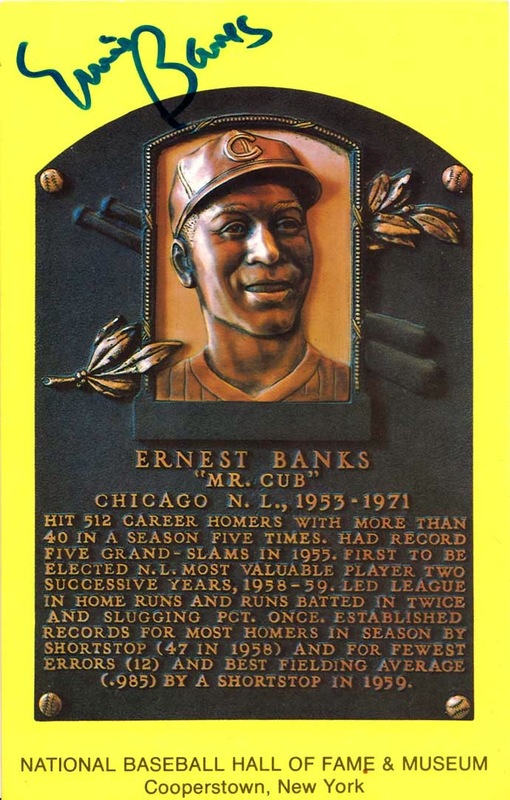 An all-time great baseball player as well as a World War II combat veteran. I had the privilege to meet Yogi a few times... my only regret is not getting a photograph with him. Rest in peace, Yogi. You will be missed. $463.76 for a half of a Mickey Mantle signature on a manufactured 1 of 1 card. 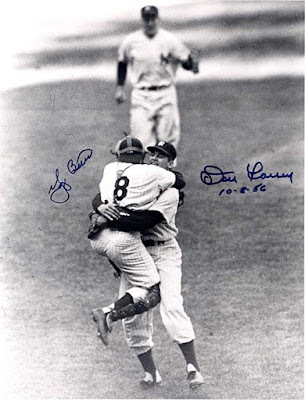 For this amount, you could buy three flawlessly signed Mantle 8x10s in mint condition and have money left over. I always say "collect what you like," but this is truly mind boggling. Every once in a while I must slow down and observe the car wreck that is Charlton Heston autographs on eBay. Four years after the Charlton Heston secretarial study, they still abound unabated. Of the first 25 listings, at least 13 are not authentic. That is a 52% fake rate. There are resources that will airbrush baseballs to remove personalizations or unwanted signatures to create a "single signed ball." It's important to note that the personalizations or unwanted signatures have not been removed, rather they have been skillfully painted over. In most cases I have seen, the sellers do not disclose this type of work has been performed. The ethics of that is another topic unto itself. For removed personalizations, look for the remaining writing to look off center or oddly placed. Sometimes you will see subtle hints of airbrushing that touches the edge of the remaining signature, or slight remnants of the removed writing that remain close to the signature. You may see slight over spray onto the red stitching and/or white spray into the holes of the stitching. Finally, if you have the ball in hand, the paint should light up unnaturally under a UV light. While the airbrush artists do a good job at color matching, what happens if the leather in the ball tones over time? I doubt the paint will tone along with it. Will you end up with a naturally toned ball that looks like it has white paint spots on it? The FBI busted the Operation Bullpen forgery ring, including the primary forger, Greg Marino, over 15 years ago. Yet his work still pollutes the hobby today. 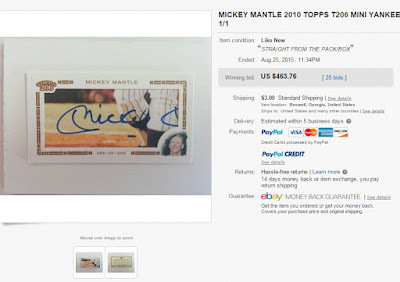 At the time, Marino’s “Mickey Mantles” were considered deceptive fakes; but they are glaringly obvious by today’s standard. Yet, fish are still taking the bait. 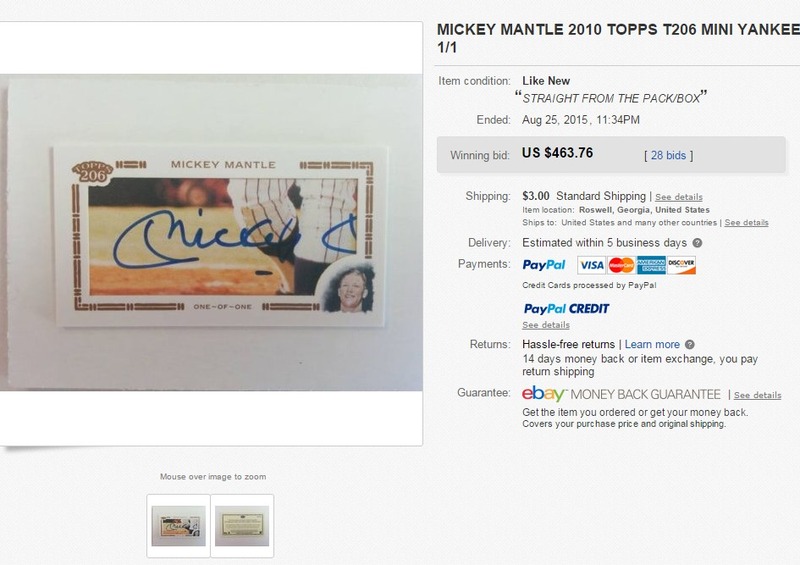 Here is someone who spent $419.14 on a worthless Greg Marino penned Mickey Mantle forgery on eBay. 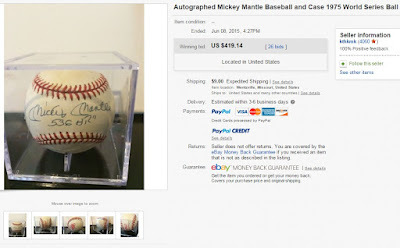 In my view, the forgery problem on eBay is as bad or worse than it has ever been. 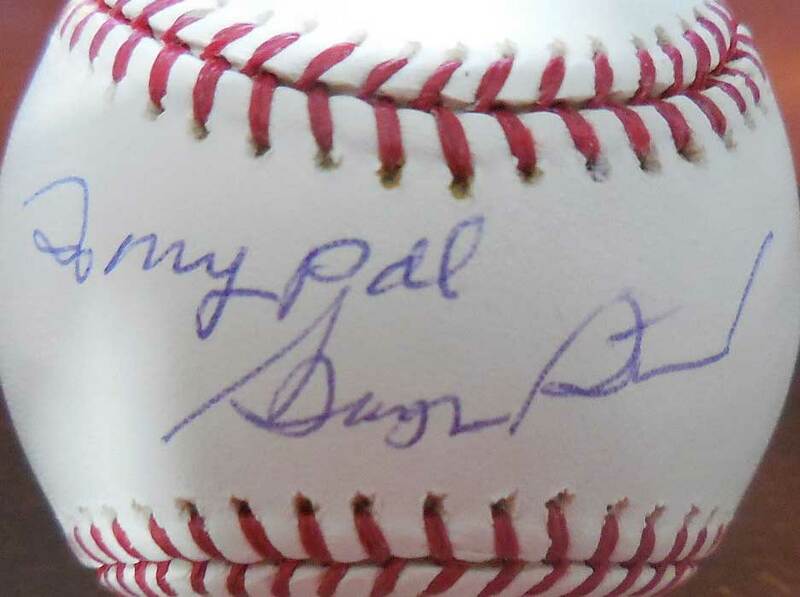 Anyone with a trained eye knows eBay is overrun with fake autographs. There are no meaningful measures in place to keep bad sellers in check and the sellers know they can peddle forgeries with impunity. Here is a Derek Jeter figurine from the Danbury Mint. A high quality statue that should got for $75 or more all day long. 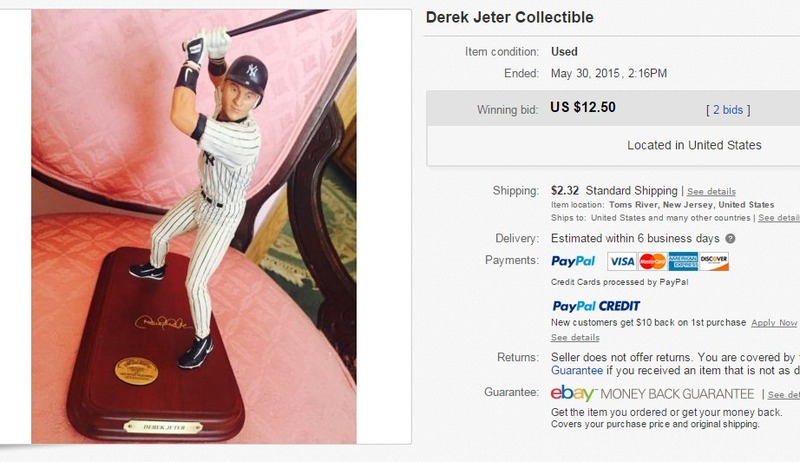 And this is what happens when it is listed as "Derek Jeter Collectible" with no description on eBay. It sold for $14.82 shipped. Common Jimmy Stewart Autopen on photo. James Stewart was a willing through-the-mail signer for many years. However, after suffering medical problems in the 1990s, his office fulfilled mail requests with secretarial signatures and an Autopen machine. The proxy signatures -- typically signed "James Stewart" -- are obvious to anyone with some familiarity with James Stewart's authentic signature. Autopen machines are most commonly used by politicians and astronauts, so some collectors are fooled and do not consider the possibility of an Autopen for a Hollywood celebrity. While some collectors are familiar with the "Jimmy Stewart" pattern sent by his office primarily on photos, there were at least four other Jimmy Stewart Autopen patterns. In the 1990s, I had a friend who worked at Crown Publishing who provided me with a dozen signed bookplates from Jimmy Stewart's book, Jimmy Stewart and His Poems. In the stack of bookplates, I identified five different Autopen patterns. Regrettably, I never properly scanned the bookplates and I thought they were lost in a move over ten years ago. As luck would have it, I recently found them mixed in with some old photos I haven't looked through in many years. 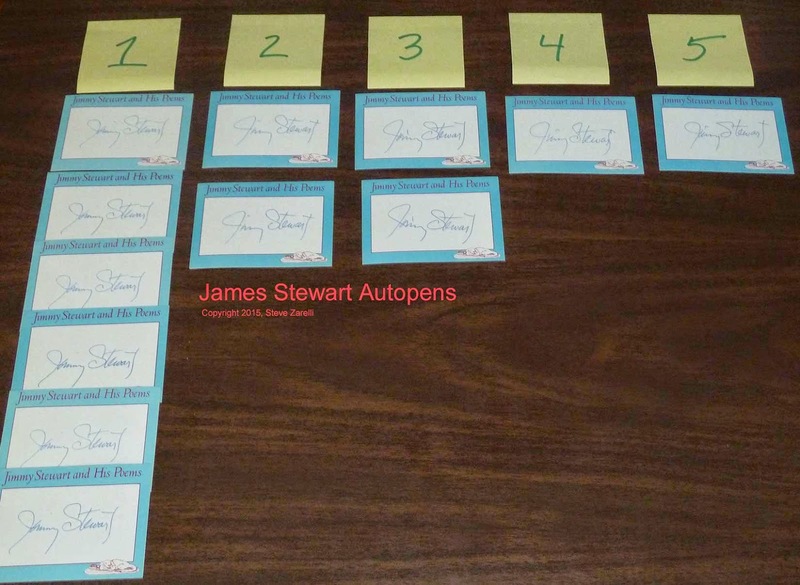 Five Jimmy Stewart Autopen patterns. There are matches for patterns 1 through 3. There were not matches for patterns 4 and 5 in the batch, however, close examination of the signatures shows tell-tale Autopen signature characteristics: hard stops and starts; evidence of machine vibration; and very subtle "jerky" mechanical motion associated with the Autopen armature. From many years of studying the nuances of Autopen signatures, I am confident 4 and 5 are Autopen machine signed without having the benefit of matching examples. In my experience, pattern #1 seems to be the one Stewart's office used most frequently and often appears on photographs. That said, it is entirely possible they occasionally used one of the other patterns, so be on the look out for any one of the five! 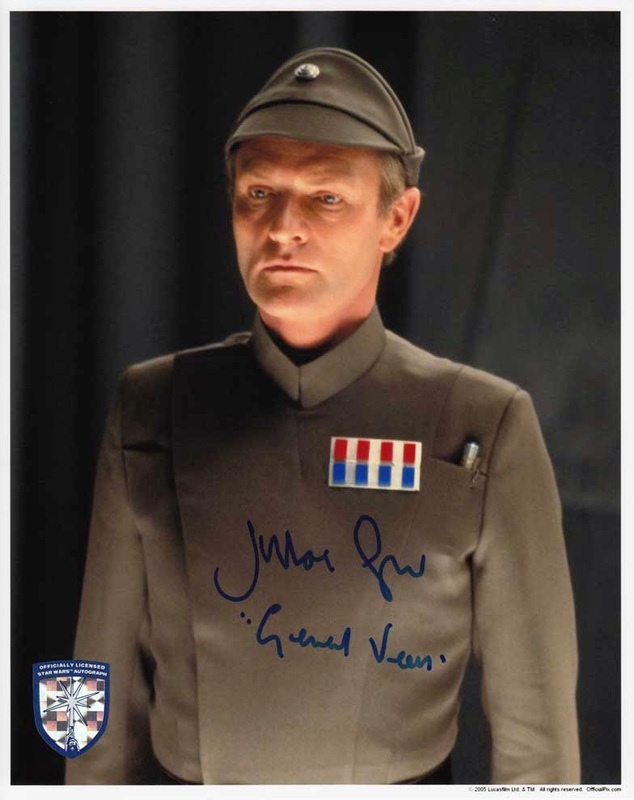 Pleasing addition to my slowly growing Star Wars autograph collection: Julian Glover as "General Veers" from the recent Official Pix signing. 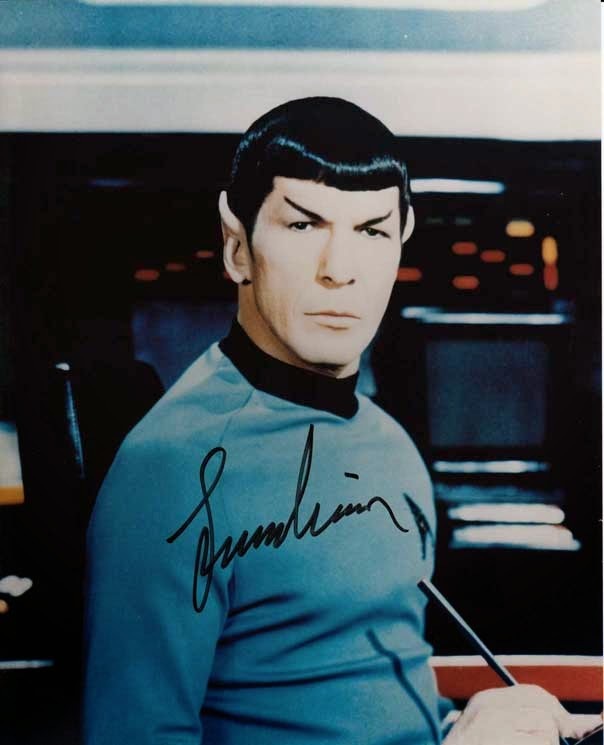 Farewell, Mr. Nimoy and thank you for many years of great entertainment! Official Pix Harrison Ford Autographs: Fast sellout! 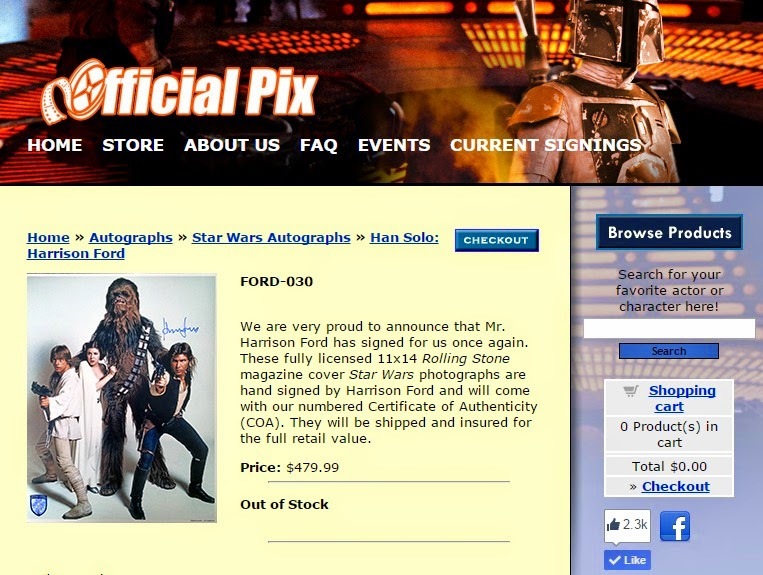 Official Pix conducted a private signing with Harrison Ford and offered signed 11x14s for $479.99. The inventory sold out in 4 minutes! The one photo available was the pose of Han Solo, Princess Leia, Luke Skywalker, and Chewbacca. I tend to avoid group poses because they force you to complete it -- a task and additional expense I don't want -- or you end up with a piece that looks unfinished. I was happy to see Official Pix offer the opportunity, but I passed. Also, I know 11x14s are popular, especially among entertainment collectors, but I really prefer 8x10s. I haven't spent as much time over the past few years focusing on comics the way I used to, but I still actively collect EC comics. The covers and stories are among the finest the medium has ever produced as evidenced by strong collector demand 60 years later. Among ECs, the trend over the past several years has been "classic covers." That is, certain covers have been in strong demand -- typically covers with the most graphic content. Interestingly, even those who do not typically focus on ECs will pursue ECs that have been by consensus deemed "classic covers." 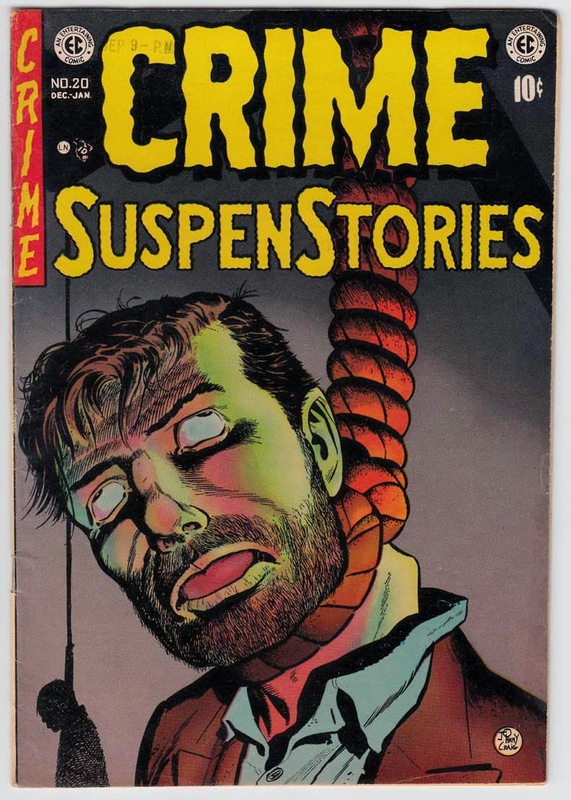 One such classic cover that has broken out in the past year or two is Crime SuspenStories 20, which features a graphic hanging image. Just a few years ago this was priced along with the other "regular issues" around it and not considered a break out. For whatever reason, the collecting community has discovered it and it is now in high demand. Thankfully, I was able to obtain a nice copy at a fair price before it really shot up in price!